The VX-1 Internet Conference Station from IPEVO is now compatible with the two newest iPhones from Apple – the iPhone 6 and the iPhone 6 Plus. Apple fans will be happy to know that VX-1 delivers superior voice communication for all their iDevices, including the iPhone 6 and 6 Plus. VX-1 is now the clear and affordable choice for users of the iPhone 6 and 6 Plus who need superior audio for teleconferencing – in the office or on the go." The recent release of the newest generation of Apple iPhones – the iPhone 6 and iPhone 6 Plus – has meant the introduction of several new features and improvements. Now, one more improvement is possible – superior audio for teleconferencing – thanks to the VX-1 Internet Conference Station. This conference station from tech company IPEVO features full compatibility with iDevices such as the iPad and now the newest iPhone 6 and iPhone 6 Plus. VX-1 is available at a price of $219 from the IPEVO Online Store at http://www.ipevo.com. The VX-1 Internet Conference Station is designed for more natural two-way conversations for virtual meetings. Five separate microphones embedded in the device can capture any configuration of voices, whether it's a single speaker or a room full of participants. The microphones function in full duplex, meaning that both parties can talk simultaneously. The default microphone is called the Omnidirectional or Omni mic, and it captures sound in a full 360 degrees so that the entire room can be heard. Separate from the Omni mic, four Unidirectional (Uni) mics can be selected to focus voice capture on a narrow section of the room while filtering out unwanted noise. In addition to its unique mic customizations, VX-1 features a 16-bit Digital Sound Processor (DSP) with built-in hardware acceleration, adaptive noise suppression, echo cancellation, and a 16kHz sampling rate. On top of this DSP, a second and specialized sound processor is dedicated to clarifying and enhancing the human voice. The result is extremely high-quality voice reproduction that sounds more like a face-to-face conversation. VX-1's intuitive button placements and simple functions – including volume, one-touch mute and mic selection – offer new users a way to immediately operate the device after only a few seconds. Plus, the current status (such as the mic configuration and mute) can be ascertained at a glance thanks to bright LED indicators. While VX-1 is plug-and-play for PC and Mac via USB, Apple users will be pleased to know that VX-1 also works seamlessly with iDevices including the iPad, iPod Touch, iPhone 5 and the new iPhone 6 and iPhone 6 Plus. VX-1 connects to these devices via a 3.5mm audio jack, transforming an iDevice into an instant conference station. Many popular VoIP programs are compatible with VX-1 including GoToMeeting, Google Hangouts, Skype, Adobe Connect and Facetime. "IPEVO always strives to keep our products current and compatible with the newest technology out there," said Royce Hong, CEO and big head of design for IPEVO. "Like us, our customers are eager for the newest technology, and we want to make sure IPEVO is right there to help them get the most out of that technology. VX-1 is now the clear and affordable choice for users of the iPhone 6 and 6 Plus who need superior audio for teleconferencing – in the office or on the go." 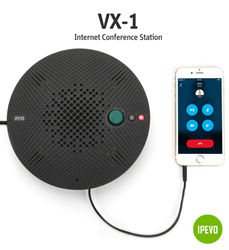 The VX-1 Internet Conference Station is compatible with PC, Mac, iPad, iPod Touch, iPhone 5 and the new iPhone 6 and iPhone 6 Plus. It may be purchased from the IPEVO Online Store at http://www.ipevo.com.